I recently weaned myself completely off a medication. It was not because I wanted to, but rather my insurance changed and the new cost of the drug was way out of my budget. So I quit it. And my symptoms returned. It was at that point that I decided to research generic options for the drug. As it turns out, there was no exact generic equivalent, but a quick chat with my doctor revealed several options that would have the exact same effect, and these were available as generics. When I went to pick up my prescription, I was shocked at the price — it was 12 times cheaper than the original medication! And yes, it is working just the same (in fact, it's better...this one has less side effects than the name-brand drug). Now there are many articles pointing out that generic versions of drugs are not quite the same. I did ask my doctor about that, and he did indeed say that some generics are just not as good. The different formulation of the drug can make a difference to the way the body absorbs and processes the drug, and some have slightly different side effects. BUT, most are just as good as their name-brand, and very pricey, counterpart. Now, knowing this I figured the generics would be the same price wherever you go, but that's not the case. Every pharmacy out there has their own generic price list program, and where you pick up your drugs could make a big difference in the final price. Some lists have different drugs on them than others, and some pharmacies will ask for additional fees to get the low price for the generics, so SHOP AROUND. Why pay more for a drug than you have to? Here then, in no particular order, are the price lists of the six major pharmacies in the US. (I apologize if your pharmacy is not covered here, but do a quick search on Google and you should find a price list in seconds). Each link will take you to a printable price list for that pharmacy. Some prices vary by state. Remember, if your pharmacy isn't listed here, that doesn't mean they don't offer low-priced generics. Do a web search or ask your local pharmacist. And don't be afraid to get different prescriptions filled at different pharmacies. UPDATE. As some readers have pointed out, there are possible issues that can arise from using different pharmacies for your prescriptions, BUT this doesn't have to be unsafe. As long as you take a list of all the medications you are taking with you to each pharmacy, they can see if there will be any interactions. This advice came from several oline sources and magazines, including Good Housekeeping and WebMD. I've always wondered about the signs that advertise a pharmacy's price for generics - what happens if your insurance copay is more than what they charge? Do you know what happens if the pharmacy charges $4 for a 30-day supply of generics, but an insurance company has you pay $10 for the same thing - do you have to pay the copay or will the pharmacy charge you their lower fee? If co-pays are more expensive than their price the store typically doesn't run the prescription through insurance and you just pay what the pharmacy charges. The only downside to this is if you need to have the prescriptions run through insurance (for meeting your out of pocket expenses to get out of the doughnut hole, for example). In response to an advertised price of $4 and a copay of $10, your pharmacy will not bill your prescription to your pharmacy benefit manager to yield the contracted reimbursed rate and instead you will pay the advertised $4 price. It's probably a good idea to discuss your financial concerns with your doctor BEFORE stopping a medication. Often they will suggest generics, alternatives, or give you sample packs of medications that the drug companies send them. CAMBRIDGE, Mass.--(BUSINESS WIRE)-- Helicos BioSciences Corporation (NASDAQ: HLCS) announced today that it is in the early stages of validating molecular diagnostic (MDx) tests that utilize its HeliScope® Single Molecule Sequencer. The HeliScope Sequencer€™s ability to sequence single molecules of natural, unamplified DNA or RNA simplifies the diagnostic testing workflow obviating the need for the amplification steps utilized by most genetic analysis methods. This ability to eliminate amplification steps has several advantages including the potential for Helicos to sell its MDx tests for substantially less than the price of comparable existing diagnostic tests. Helicos believes that the HeliScope Sequencer will have utility across a broad array of MDx tests. Initially, Helicos is developing a MDx test that will identify gene mutations indicative of a woman€™s increased risk of developing hereditary breast or ovarian cancer. This test is currently scheduled to launch during the second quarter of 2011. Helicos is also developing additional MDx tests in well-established markets. Helicos intends over the longer term to use its core technology€™s quantitative capabilities to explore developing MDx tests based upon the detection and quantification of foreign DNA/RNA circulating in the bloodstream, such as a non-invasive prenatal diagnostic test. In furtherance of its new strategic plan, Helicos has begun development of its own genetic testing laboratory for which it expects to seek certification under the Clinical Laboratory Improvement Amendments of 1988 (CLIA). In connection with this, Helicos recently hired Dr. Robert Wassman as Chief Medical Officer (CMO). Dr. Wassman has over 25 years of experience in the clinical translation of innovative genetic testing technologies, and has held a variety of professional and senior management positions. Most recently, he was a Founder and CMO of Good Start Genetics, a company focused on the application of €œNext Generation€ DNA sequencing to assess individual carrier status for rare genetic disorders. Previously, he was President of Celula, Inc., which developed instruments for the isolation and analysis of rare, highly informative cells for personalized diagnostics. Prior to these start-up ventures, he was the Vice President and National Medical Director of Genzyme Genetics, where he held operational responsibility for all clinical services and genetic counseling, and also led business development and new product implementation for their reproductive franchise. Additional information can be found in Helicos' Annual Report on Form 10-K for the fiscal year ended December 31, 2009, as filed with the SEC on April 15, 2010, together with its Quarterly Report on Form 10-Q for the first fiscal quarter 2010, as filed with the SEC on May 17, 2010. These reports include a discussion regarding the company€™s need to raise capital to pursue this new business of developing molecular diagnostic tests, disclosures regarding the company€™s operational results and liquidity position, and additional disclosures regarding other risks and uncertainties faced by Helicos. Helicos BioSciences is a life science company focused on innovative genetic analysis technologies for the development and marketing of MDx tests. Helicos€™ proprietary True Single Molecule Sequencing (tSMS)TM technology allows direct measurement of billions of strands of DNA enabling the delivery of competitive MDx tests at lower price points than current tests. The company€™s corporate headquarters are located at One Kendall Square, Building 700, Cambridge, MA 02139, and its telephone number is (617) 264-1800. For more information, please visit www.helicosbio.com. Certain statements made in this press release that are not based on historical information are forward-looking statements which are made pursuant to the safe harbor provisions of the Private Securities Litigation Reform Act of 1995. This press release contains express or implied forward-looking statements relating to, among other things, the prospective value of the unique attributes of single molecule sequencing in the diagnostics markets, Helicos€™ belief that its technology is capable of meeting needs in the diagnostics markets in the near term, Helicos€™ beliefs regarding its ability to introduce successful diagnostic sequencing applications utilizing Helicos technology, Helicos€™ beliefs regarding competition from other companies in the diagnostics market, and management€™s plans, objectives and strategies. These statements are neither promises nor guarantees, but are subject to a variety of risks and uncertainties, many of which are beyond Helicos€™ control, which could cause actual results to differ materially from those contemplated in these forward-looking statements. In particular, the risks and uncertainties include, among other things: our ability to successfully implement a strategic shift to focus the business on the diagnostics markets utilizing the HeliScope Sequencer; a third party suing us for infringement of intellectual property rights; the costs of, and potential for an adverse outcome from, any intellectual property litigation; our history of operating losses and ability to achieve profitability; our ability to sustain our technology and know-how; competition; changing technology and customer requirements; our ability to operate in an emerging market; market acceptance of our technology; the length of our sales and implementation cycles in the diagnostics markets; failure of our technology and products; ethical, legal and social concerns surrounding the use of genetic information; our ability to retain our remaining personnel following our May 2010 reduction in force and our ability to hire additional skilled personnel required to pursue our diagnostics strategy; our ability to manage our growth while operating with limited resources; our ability to control our operating expenses; general economic and business conditions; our ability to obtain capital when desired on favorable terms including our need for significant additional capital prior to the end of the third quarter 2010 to fund our operations; our current financial resources and substantial doubt about our ability to continue as a going concern; and the volatility of the market price of our common stock. Existing and prospective investors are cautioned not to place undue reliance on these forward-looking statements, which speak only as of the date hereof. While Helicos anticipates that subsequent developments may cause the company's views to change, Helicos undertakes no obligation to update or revise the information contained in this press release, whether as a result of new information, future events or circumstances or otherwise, except as required by law. For additional disclosure regarding these and other risks faced by Helicos, see the disclosure contained in Helicos€™ public filings with the Securities and Exchange Commission. The last sentence of your piece yields your ignorance. Price is not the only factor for choosing where to have your prescription filled. "And don't be afraid to get different prescriptions filled at different pharmacies." is the most ridiculous advice which can be given. Have you ever thought about drug interactions and drug/health condition interactions? If you have not and do not care about your reader's health, then your article makes sense. Isn't it: a) the job of your doctor to know the prescriptions you are currently taking and b) the job of the pharmacist to make sure you don't have any possible interactions? Your response implies that if you don't get every single prescription filled at the same exact pharmacy, then you could be in real physical danger. That makes no sense to be honest. If you don't run prescriptions on your insurance and you use multiple pharmacies you ARE in danger. By going to different pharmacies the pharmacist cannot check what you are taking. I know certain systems check and see what others medications you are on and show possible interactions. The pharmacist then acts on these. If you get one drug at Wal-Mart and one at Target and there is an interaction it will likely not be caught. If a medication is purchased with insurance your insurance will automatically compare medications and send back any major interactions between medications from multiple pharmacies. Advising people to use multiple pharmacies is a very UNWISE decision. This article is encouraging what is known as "polypharmacy" (where you jump from place to place and get prescriptions filled at multiple pharmacies). This makes it harder to catch potential interactions. This is one reason why I hate the fact that healthcare is a business. Whenever I'm personally counseling a patient, I always tell them I don't care where you go to fill the prescriptions, just please go to one pharmacy and stick with them. Nonsense. Doctors are responsible for knowing the medical history of their patients, and that means asking them what medications they take. If the patient lies, that's not their responsibility. Whenever any prescription is filled, it's required to come with warnings about usage, dosage, possible drug interactions, and contraindications. Therefore, it makes no difference where you get the prescription filled or even if you have different prescriptions filled by different pharmacies. They all charge different prices for the same drugs, so choosing the lowest cost pharmacy doesn't harm the patient in any way. 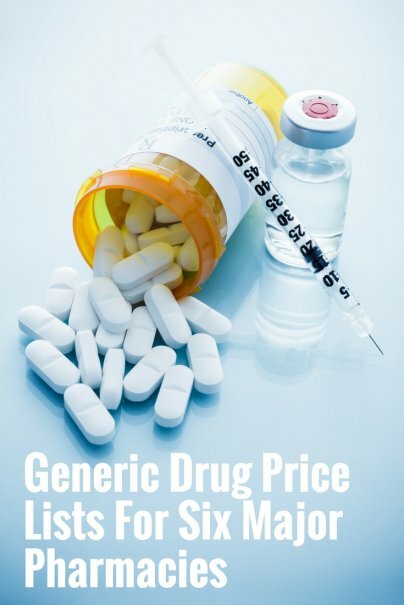 More and more people are being aware of cheaper generics. I have a friend when who jumping up and down to learn that lipitor will be available in generic form soon. You might want to update your information about CVS's generic program. Their program is for 90 day fills only at $11.99 and they charge a yearly fee of $15.00 - Not the best deal. I am a pharmacy technician working on a book I'm writing about all the ways people can save money (switching to generics is just one way). I thought I'd point out that the Kroger list is the same for all the stores Kroger owns that have pharmacies: Fred Meyer, Smiths, Fry's, King Sooper, Ralphs, QFC, Dillons, City Maket, and Gerbes. I looked at the list at all of the websites for those stores, and it's identical at each one. When using one of these pharmacies $4/$10 generic "programs" you DO not use your insurance. Do NOT give the pharmacy technician your insurance card when you hand them your prescription(s). Your are paying $4.00 period - out of your pocket. If you have insurance, I would recommend doing the following first, before you go to a local pharmacy to get this low rate. Call customer service for your pharamcy benefits - the number will be on the back of your pharmacy benefits card (not on your medical card). Ask them what a 30 day supply will cost you, and what a 90 day supply will cost you through mail order - your insurance is not likely to allow 90 days at a local pharmacy. Your cost using your insurance might be less. It's worth making one phone call to see which will be cheaper. If you have no insurance at all and the meds you are taking are on the $4/$10 list, then absoleutely do it. These are great prices. Also, those of you who have insurance - you can usually do the pricing yourself at your insurance company's website. Just be sure to choose the correct strength of the drug and the correct dosage (number of pills). Let me give you an example of how I used the $4 program earlier this year at Fred Meyer. One day I was have some truly nasty back pain. The pain was bad enough that I left work to see my doctor. She prescibed two medications - one a pain killer, the other a muscle relaxant. She wrote both for just a small supply since this back issue was just a flare-up. I wan't going to need either of these medications for a long time. Before I went to Fred Meyer to have them filled, I accessed my insurance company's website and priced both medications. Then I went to Fred Meyers website to see if both meds were on the generics list, since both of the medications were generic. One was on the list, one wasn't. Lucky for me, the med that WAS on the list for $4.00 would have cost me about $62.00 if I had used my insurance. The drug that was NOT on Fred Meyers list WAS covered by my isurance - a $5.00 copay. So, when I went to Fred Meyer I told the techinican to bill my insurance for one medication and to give me the other on their generics program. I walked out of the store with two medications and the total bill was only $9.00 - no sales tax here in Oregon. It pays to make that phone call or check website or two. The links for Target and CVS don't work!